We’re quite excited to welcome a new addition to our family. Factor Bikes may be a new name to some, but we’ve been watching them for more than a decade as they’ve evolved their manufacturing from a single SuperBike Concept to a full line of futuristic road racing machines. With Team Ag2r-La Mondiale now racing their frames in the UCI ProTour, Factor has achieved much wider exposure and we’ve seen more people expressing interest. What surprised us is that the appeal lies not just in the team association and the top-of-class ride quality, but also in the impressive value that their frameset packages bring. We have a standard Factor O2 rim brake bike that we’ve been riding and have nothing but good things to say about the frame design and ride characteristics. However, we’re going to delay our in-depth review until the completion of this O2 Road Disc project. For now, we’re going to take a look at the frameset package we’re starting with. “Value” isn’t always a term commonly associated with a $5,000 frameset, and prior to receiving our first shipment, that wasn’t at all our expectation. However, once we had a closer look at what’s included for that price the value becomes readily apparent. 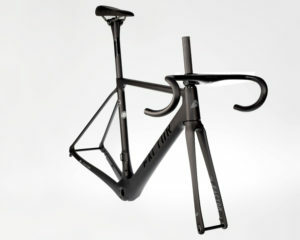 Of course the frameset, which Factor refers to as the “chassis,” includes the frame. Ours is a 52cm O2 Disc in stealth black. With a weight of 853 grams, it’s pretty dang close to the claimed weight of 850 grams. Next up is the fork. Our flat mount disc fork came in a 365 grams with an uncut 300mm steerer and an integrated crown race. We’ll be cutting about 100mm off that steerer and would think that the finished weight will come in somewhere around 320 grams. It’s pretty much an industry standard that nearly all framesets are supplied with a headset. However, we’ve found that most manufacturers skimp on the quality of the headset as a means to lower total production costs. All Factor framesets include a CeramicSpeed headset, valued at nearly $300. The headset on our O2 Disc tipped the scales at 60 grams. Another example of Factor’s attention to detail is the included bolt-style thru axles. Factor’s 12×100 front and 12×142 rear thru axles weighed in at 25 and 32 grams, respectively. That’s right on par with the lightest available thru-axles from Carbon-ti, which run about $150 per set. As far as frameset packages go, this is where the buck stops for most other manufacturers. With Factor, we’re just getting started. In making the leap from frameset to chassis, the first thing Factor adds to the O2 Disc is their Black Inc Integrated BarStem. Available in 36, 38, 40 and 42cm widths (measured center to center) – and with stem lengths of 90, 100, 110, 120 and 130mm. The bar is designed for internal cable routing as well as internal Di2 routing for use with the Shimano RS-910 bar end A-Junction box. For this build, we chose a 40cm bar width combined with a 100mm stem. The Integrated BarStem is full carbon and includes a slick integrated Garmin mount, as well as titanium stem bolts (surprisingly, the washers under the bolts are also titanium – not really a necessary detail, but a fine example of Factor’s level of attention). Our BarStem came in at 296 grams. 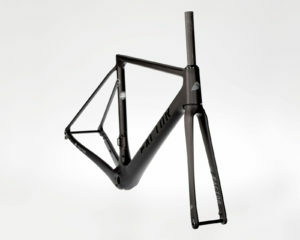 Black Inc’s price list puts the retail value of this cockpit component at $650, a fairly standard price for an integrated bar and stem. Also included is their Black Inc full carbon seatpost; with options for either 0 or 25mm offset, both in 350mm length. Our chassis included the 0 offset, which weighed in at 182 grams. While certainly not among the lightest seatposts available, this weight is competitive with those from manufacturers such as Enve and Easton. 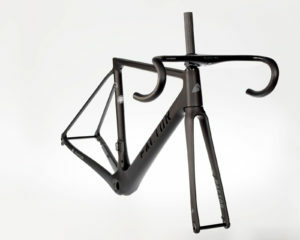 The Black Inc seatpost is set up for use with oversize carbon rails. The value of this post is $300, again on par with pricing of similar carbon seatposts. In addition to the seatpost, Factor’s chassis includes a premium saddle (which we have to admit is a bit odd given that saddles can be such a personal choice). However, at least they’ve chosen one of the most popular saddles, and in a high end trim – Fizik’s Arione R1 with carbon shell and full carbon rails. Our saddle came in at 168 grams; that adds an additional $250 to our added value list. Next on the list is the bottom bracket. The Factor O2 Disc uses the BB386 EVO standard. We really like this standard as it is a light and durable approach to a near-universal bottom bracket that easily works with the lightest cranksets on the market. Factor could have included the standard BB386 EVO bottom bracket, but instead opted to include a premium CeramicSpeed model which would normally add $360 to a build. Our bottom bracket weighed in at 95 grams. 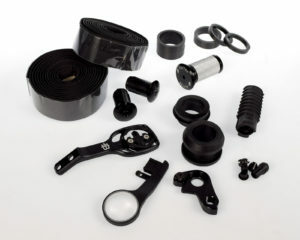 Additionally, the bottom bracket also included multiple adapters from Wheels manufacturing, allowing virtually any crank to be used without having to purchase additional parts. When we add up the retail value of all the additional inclusions that come with the chassis we find $2150 worth of add-ons. That leaves the the frame and fork with an effective retail price of $2850 – not bad for a world-class frameset capable of pro-tour competition! Keep an eye out on our blog as we work on this project build over the next several weeks.